Chief Minister Sheila Dikshit's security was today beefed up after the police got an anonymous call warning that her life was in danger. After remaining absent from duty for many years, a pathologist with the district hospital in Gautam Budh Nagar, Richa Saxena, under scanner for goof ups in the controversial Aarushi Talwar murder case, has been dismissed from services. A Delhi court today dismissed the plea filed by a lady doctor challenging an order initiating criminal proceedings against her for allegedly leaving sponge in the body of a patient, leading to the latter’s death. The national Capital will reverberate with the sounds of Bengal on Rabindranath Tagore’s 150th birth anniversary on Sunday. A 35-year-old businessman was shot dead by unidentified assailants in the Nihal Vihar area of outer Delhi last night. According to information, Gajraj was returning from Haryana in his Wagon R car when he was shot at near the Mansa Ram Hospital. The Municipal Corporation of Delhi (MCD) today expressed concern that the construction sites of Commonwealth Games are a breeding ground of vector-borne diseases. The staff of Chandni Mahal police station has apprehended three persons— Furkan (40), resident of Main Fazil Road, Chhatta Lal Miyan and his son Tariq— for illegal slaughter of sheep. According to the police, they have seized 20 slaughtered sheep and 10 live sheep from their possession. The Delhi High Court has underlined the need for providing good facilities to poor students in private schools and directed the government to consider revising the rates for reimbursement of the cost of their books and uniform. A right to information activist has filed a complaint with the Central Information Commission (CIC) against the Municipal Corporation of Delhi (MCD) for allegedly not having a Central Public Information Officer (CPIO). The special children from Umeed NGO were quite happy today when Bollywood heartthrob Shahid Kapoor met them in the Capital and spend some time with them. Studies suggest thyroid disorders hamper the quality of life for over 1 in 8 women across their lifetime and such affected women either have failed pregnancies or give birth to children with low IQ. To go further, women are at higher risk of thyroid disorders than men, yet the problem is often neglected. Doctors suggest expectant mothers to go for screening. Two robbers were caught and arrested while trying to flee after robbing a Honda City car in the Sarita Vihar area of southeast Delhi last night. A five-year-old boy sleeping with his maternal grandmother outside the house was abducted from the Vijay Nagar police station area. The old woman, Kapuri Devi, was sleeping in the open due to power cuts. With the arrest of one Arif (19) and Salman (19), both residents of Gokalpuri, the staff of the New Usmanpur police station has claimed to have solved the murder case of a 40-year-old man that took place on April 22 in the Khajuri Khas area. The south district police has arrested two persons and claimed to have busted a gang of robbers allegedly involved in several cases of robberies and motorcycle thefts. The accused— Omkar (27) and Manoj Dua— are residents of Delhi, and according to the police, usually targeted departmental stores during closing time. A 29-year-old man has been arrested for allegedly making a hoax call about a bomb in the Amritsar-bound Shatabdi train yesterday. The call had led to a search of the train, which was delayed by three hours. A mock security drill was today conducted in the CGO Complex to check the preparedness of various agencies in case of an emergency situation. Chief Minister Sheila Dikshit today handed over physical fitness equipment worth Rs 5 lakh under ‘My Delhi I Care Fund’ to two Residents Welfare Associations (RWAs)—Golf Link Association and RWA of Central Government Employee. Delhi today witnessed a humid day with the mercury hovering around 38 degree Celsius, the Met office said. 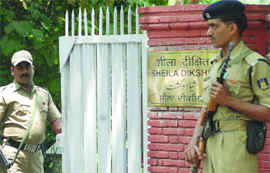 Chief Minister Sheila Dikshit's security was today beefed up after the police got an anonymous call warning that her life was in danger. According to police officials, they have stepped up Dikshit's Z Category security following the telephone call on Thursday night. The police said the caller claimed that Dikshit's life was in danger for the next 72 hours. "We got a call at 11 pm. The caller said the Chief Minister's life was in danger for the next 72 hours. As a precaution, we have stepped up her security," said a senior police official. Though, the police is trying to trace the caller, the officials declined to give details of the additional security provided to the Chief Minister. Those under Z Category security get 22 personnel to protect them. However, an unruffled Dikshit said she was not worried. "I don't have any fear. I am not worried," said Dikshit while talking to reporters on the sidelines of a function in the Capital. Asked if she needed additional security, Dikshit, who has been the Chief Minister of Delhi since 1998, said it was not her duty. "Actually, I wanted to cut down my security," she said. An official of the Chief Minister's office said Dikshit was attending her engagements as per schedule. Indian VIPs are given protection under four categories -- Z+, Z, Y and X. The VIPs with Z+ security get 36 security personnel to guard them. Those with Y and X categories are provided 11 and two personnel, respectively. According to the district hospital administration, Saxena did not report for duty for many years. On July 22, 2009, she was asked to explain her absence, but when she ignored the notice, the authorities decided to dismiss her from duty. Saxena was handed over the samples of swabs of Aarushi for medico-legal examination. But she came under suspicion after the medico-legal register of the hospital was reported missing in 2008. The register contained Aarushi's medico-legal information. Also, the swab samples sent to a Hyderabad-based forensic lab for examination were not found to be that of Aarushi's. Saxena was found absent from duty even on the day Aarushi's swab samples were reportedly handed over to her, though the duty doctor had not registered her absence. But, founding her role suspicious, the Central Bureau of Investigation (CBI), which is probing the case, has interrogated Saxena many times. Her outspoken nature has also reportedly contributed to her dismissal. Despite of strict orders from the authorities against talking to media about the case, Saxena had been constantly interacting with the media. According to reports, Saxena was also not on good terms with principal secretary, health, Neeta Chaudhari. Saxena was employed by the Gautam Budh Nagar district hospital as a pathologist in 2005. Additional sessions judge Dharmesh Sharma refused to quash the proceedings started against Dr Chitra Bhatnagar under Section 304 A of the IPC for alleged medical negligence. The court said the presence of a sponge or gauze with a tag, while performing caesarean operation is a case of “gross negligence”. Bhatnagar, who along with two other doctors Vinod Thukral and Asha Gupta at Parmarath Mission Hospital, was ordered to be prosecuted for a botched-up operation of deceased Sapna. A complaint was filed with Roop Nagar police station by Yadveer Singh Chauhan, alleging that his wife Sapna, who was earlier being treated at Parmarath Mission Hospital here, was operated upon on May 25, 1998, at Hindu Rao Hospital in which a sponge-like foreign body measuring 17 cm x 17 cm and a tag of 11 cm was removed from her abdomen. She died the next day due to cardiac arrest. Bhatnagar had challenged the order taking cognizance against her on October 6 last year on the ground that it was done several years after the death and that there was no direct evidence of the presence of foreign body in the patient. The court, however, did not agree with her contention, relying on the opinion of the medical board. According to information, the medical board, after examining the entire medical records of the deceased was of the opinion that the foreign body was responsible for infection and it endangered the life of the deceased for about a year. The infections in the body of the deceased led to multiple complications, ultimately resulting in cardiac arrest. With regard to Bhatnagar’s contention that there was delay in the matter, the court said it was due to inaction of the police. “It is a case of police inaction and the complainant cannot be faulted for it. Moreover, the facts of the case are such that it would be in the interest to sustain the taking of cognizance even after the expiry of period of prescribed limitation (of filing the case),” the court said. Prime Minister Manmohan Singh will inaugurate an exhibition ‘The Master Strokes: Art of Rabindranath Tagore’ at the National Gallery of Modern Art on Sunday morning. Union finance minister Pranab Mukherjee will release a special commemorative coin on the Nobel laureate to mark the occasion. He will unveil the coin at a tribute, Rabindra Pranati, at the Mehgdoot theatre in Rabindra Sadan. The theatre will also be the venue for a open soiree of Tagore’s music from 6 am-12 noon featuring artists from Delhi and the national capital region on Sunday. A compilation of songs from Tagore’s anthology ‘Geetanjali’, accompanied by recitation, will be presented by Jayati Ghosh at the India International Centre on Sunday evening. It will be presided over by Chhattisgarh Governor Shekhar Dutt. It will be held in collaboration with Impresario and Rabindra Bharati University. The spread of events is bigger and varied this year with the Sangeet Natak Akademi, Sahitya Akademi, Lalit Kala Akademi and the union culture ministry joining hands to mark the occasion. The celebrations began on May 7 with an exhibition of Tagore’s books, ‘Tagore’s Treasures’, at the Sahitya Akademi. It showcases ‘Renderings of Gitanjali’ in different Indian languages by eminent poets. Other programmes on Sunday include ‘Kavyanjali, a poets’ meet, puppet play, dance performance and songs by a Kolkata choir. Tagore, the 14th of the 15 siblings, was born in 1861 at Jorasanko in Kolkata. The yearlong celebrations are likely to see a resurgence in awareness about the Nobel Laureate’s contribution to world literature and an affinity to his works among the GenNext. “Rabindranath Tagore is still very relevant even outside Bengal. His music is everlasting. But he is not read by youngsters as he used to be even 10 years ago, primarily because Bengali children do not study the language in schools outside Bengal any more. The world could do with more translations of Tagore’s songs,” Sudhir Chanda, an alumnus of Shantiniketan, and who teaches Rabindra Sangeet in Chittaranjan Park, said. Chanda, who has been living in Delhi for the past 50 years, is a member of the Bengal Association, which is organising a Prabhati Anusthan - morning concert. Veteran Bengali actor, Soumitra Chatterjee, also echoed the sentiment. As per the police, about six rounds of bullets were fired at Gajraj. Three bullets hit him on the neck and chest. “The incident took place close to midnight. The police was informed by eyewitnesses after Gajraj lost balance of the car and hit a road divider. Initially the police thought it to be a case of accident, but the post-mortem of the body at the Sanjay Gandhi Memorial Hospital confirmed bullet injuries,” said a police official. The police believes that Gajraj, after being shot at, managed to dodge the assailants and was rushing towards the nearby hospital. However, due to the injuries and the resulting blood loss, he seems to have lost balance and hit the divider. A police team reached the accident site and rushed Gajraj to hospital, but he was declared brought dead. Gajraj is a resident of Kunwar Singh Nagar in the Nangloi area and owns an iron plant at Kirari village. He is survived by his wife and two children. A case of murder has been registered and the police is investigating the matter from the angle of personal or business rivalry. “Nothing can be said as of now, but it seems robbery could not have been the motive of the assailants,” said the official. Municipal commissioner K.S. Mehra today alerted all the civic agencies to make efforts in their areas to eliminate mosquito-genic conditions. “There is potential for the spread of such diseases in view of the large-scale construction activities and presence of migrant labour. We have to be extra alert,” Mehra said. He was addressing an inter-sectoral coordination meeting where officials from agencies like Delhi police, Delhi Jal Board, DDA, DMRC, Northern Railway, DTC, flood and irrigation department and DSIIDC were present. Mehra said that special care would be given to unauthorized colonies from where most cases are reported. “We have asked the irrigation and flood control department and DSIIDC to ensure free flow of water in these colonies. It is important that the drains are kept clean and there is regular desilting of drains,” he said. During interrogation, the accused disclosed that they were slaughtering the sheep to sell their meat. The live sheep have been handed over to the slaughtering department of the Municipal Corporation of Delhi. A 33-year-old labourer was crushed to death when hit by a speeding truck in Okhla today morning. According to the police, the victim, Shyam La, used to load and unload vegetables and fruits from trucks coming to the Okhla vegetable market. “A truck with MP registration number crushed Lal . The driver of the truck managed to flee. We have impounded the truck and efforts are on to nab the driver,” said the police . A hoax bomb call received by a public school in Sangam Vihar today caused inconvenience to hundreds of students. According to the police, the anonymous caller informed the authorities at Amrita Public School in Block A about a bomb being planted in the school. The police was informed about it, after which an hour-long search by bomb disposal squad was conducted. However, no explosive was found. The court was hearing a suit seeking contempt action against a Delhi-based private school for allegedly not complying with the court’s earlier order for reimbursement of the money spent by poor students on books and uniform. “Students of the EWS are entitled to read the same books which are available to other students, otherwise they will not be able to compete with them,” the court said while directing the school to file its reply within three weeks. A parent had approached the court stating that her two children studying in the school’s classes X and VI were not given summer uniform and free books. However, counsel for the school cited financial limitations and informed the court that the school can bear an annual cost of Rs 2,151 for the petitioner’s child in class X and Rs 3,355 for her child in class VI. The cost of the summer uniform is Rs 1,500, counsel said. “But the government is not releasing more than Rs 500 as uniform subsidy per student and Rs 600 towards the books for each poor student in class X and Rs 244 for each poor student in class VI,” counsel said. The court also directed the Delhi government to consider revising the current schedule of reimbursement of books and uniform for poor students. The activist alleged that by not appointing a CPIO, the civic agency had ignored the mandatory provisions of the Right to Information Act. “Petitions addressed to CPIO sent through registered post to the MCD headquarters at Town Hall, Chandni Chowk, are returned with a stamp stating ‘no such post at MCD Town Hall (headquarters)’,” said Subhash Chandra Agarwal who filed the complaint with the CIC.“This is a gross violation of the provisions of the transparency law,” he added. According to Agarwal, the MCD used to entertain such petitions earlier, but recently the authorities have started showing a disregard for RTI petitions. “The Central Information Commission and the department of personnel and training (DoPT) should look into the matter, and take action against the competent authority in the MCD,” Agarwal said. Action should also be taken against the MCD executive responsible for receiving RTI applications through post so that users of the transparency law are not harassed, he said. “A RTI applicant who needs any information can address his application to ‘public information officer’. The application will definitely be transferred to the department concerned,” he said. Umeed, run by the Air Force Wives Welfare Association, organized an interaction for the special children with the actor at Air House. Umeed imparts vocational training to special children by teaching them simple trades like candle-making, etc. Shahid was accompanied by father and critically acclaimed actor, Panjak Kapoor, and mother Supriya Pathak at the event. Incidentally, Shahid Kapoor will be seen donning the shoes of an Air Force officer in his upcoming film, “Mausam. Directed by father, Pankaj Kapoor, the film will also feature Supriya Pathak in a role of an Air Force Officer’s wife. Pankaj Kapoor will also be seen in a cameo role in the film. In this regard, the Indian Thyroid Society and Abbott India have launched a campaign today, urging all women and expectant mothers to undergo thyroid testing. “The most common disorder occurring during pregnancy is thyroid hormone deficiency, or hypothyroidism. That is why we decided to initiate an awareness campaign and it is important that as part of a precautionary measure, women should check their TSH level as soon as pregnancy has confirmed. Undiagnosed thyroid condition in pregnant women increases the risk of stillbirth and premature birth,” said Prof R V Jayakumar, president of the Indian Thyroid Society. According to the city doctors, disorders of the thyroid are the commonest endocrine problem next to diabetes in India. According to information, the robbers managed to take possession of the car at gunpoint, but were caught by the people when the stolen car got stuck in a traffic jam a kilometer away. The incident took place around 10 pm when one Rajesh, a driver with a private news channel in Noida, was on his way to Sarita Vihar in office’s Honda City car. He was intercepted by three Pulsar bike-borne men soon after he crossed the Okhla Barrage near Kalindi Kunj. “The two robbers managed to evict Rajesh out of car at gunpoint and sped towards Apollo. 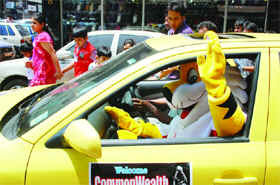 However, as Rajesh called the police and shouted for help, some people chased the car which got stuck in a traffic jam. The robbers tried to run away after leaving the car, but were chased and caught. They were severely beaten up,” said a senior police official, adding that their third accomplice managed to flee. Rakesh Jogi, father of the abducted boy, Arvind, has lodged a report with the police. Jogi lives in Gali No. 1, Sudama Puri Colony in Vijay Nagar. Some of Jogi’s relatives also live in the neighbourhood. Kapuri Devi said she had woken up as a lanky man pulled the side of the mosquito net, lifted Arvind and fled. As she raised the alarm, some people came to her cot. Some even chased him, but the abductor disappeared in darkness. Vijay Nagar SHO P.K. Singh inspected the spot. Arvind’s father said he does not have enmity with anybody. According to S.S. Yadav, DCP (north-east), the victim, identified as Ramesh, a resident of Kartar Nagar, was killed by the accused for Rs 3,200. “We arrested the duo after investigation hinted towards their involvement. On interrogation, they broke up and disclosed that they along with two of their accomplices stabbed Ramesh with a broken bear bottle near the Khajoori traffic light about two weeks ago and robbed him of Rs 3,200,” said Yadav, adding that efforts were on to apprehend the remaining accused. According to H.G.S. Dhaliwal, DCP (south), the duo was arrested yesterday from Saket and two country-made pistols were seized from their possession. “They used to target big departmental stores like Reliance Fresh and Big Apple Mart etc. at the time of closing when the shops had maximum cash and very few customers. The also targeted money collection centers. They would travel on stolen motorcycles and use arms to threaten victims,” said Dhaliwal. According to B.S. Gurjar, additional DCP (railways), the accused, Jagdeep, had made the call because he missed the train. Jagdeep is a resident of Tilak Nagar in west Delhi. “We identified and arrested Jagdeep yesterday itself. He has confessed to his crime and said that he made the call to delay the train so that he could catch it,” said Gurjar. The security officials, including the railway police, had to conduct a three-hour search after the deputy superintendent of New Delhi Railway Station received the call about presence of bomb in the train. According to the police, the security drill was carried out at the solar energy complex in CGO Complex at Lodhi Colony where a “mock fire” broke out. A senior police official said the drill was conducted by the CISF, which guards the complex. Various agencies like the fire department and police also participated in the drill. Dikshit expressed confidence that the residents would utilize the equipment properly and live a disease-free life. The maximum temperature settled at 38.3 degree Celsius, two degrees below the average, while the minimum temperature was recorded at 23.6 degree Celsius, one notch below the average for this time of the year. “There would be mainly clear sky in the next 24 hours with maximum,” said an India Meteorological Department (IMD) official. “The minimum temperatures likely to settle around 39 degree Celsius and 25 degree Celsius respectively,” he added. On Friday, the maximum temperature was 35.6 degree Celsius.